You are an Author or would like to be one or maybe you represent a publisher and want to create a free mobile app to share your books and stories with the masses. You’ve come to right place, as appsbar is the top free app building site on the web. As the number one place to build an app for free in the world, appsbar.com can help you build a free Android App and publish it in Google Play, and a free HTML 5 app that acts as an Android App, iPhone App, iPad App, Winows Phone App and as a Facebook App or as a free mobile website in no time at all. The first thing we did to make the DIY App Builder experience easier was to start you off with eight app page types free mobile app that we thought were important for a writer or publisher such as yourself (don’t worry, you can add more pages as you’d like) . The About Page of your free app built with the appsbar app builder is pretty simple – it gives you the ability to use text, images or a combination of both to tell your fans about your book in your free app, how you got started or any inside, behind the scenes information you’d like to share with the readers of your new free app. The Services Page of your appsbar app is your opportunity to list all of the services your publisher provides in and out of your free appsbar app. 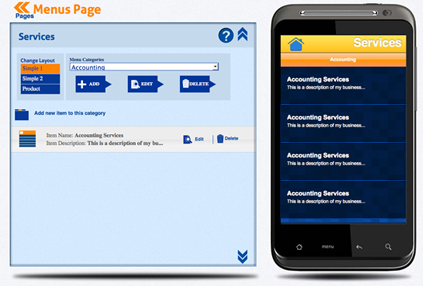 You can include descriptions of each service you provide, the price of the service and an image in your mobile app. 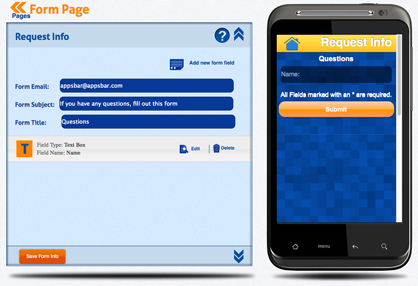 The Request Info Page of your free app lets you create a form or forms with questions or seeking feedback for your reader to fill out that can be sent to you via the email address that you provide when creating the page in the free app building process. This page is useful as it allows your user to contact you through your appsbar app. 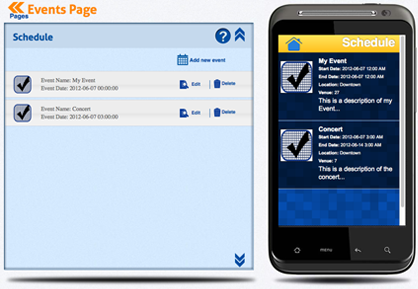 The Schedule Page of your app you build with the appsbar app builder allows you to create events such as appearances, book signings, workshops, special events, or discounts that you can offer to your readers that last for a specific amount of time or happen on a specific date through your appsbar app. 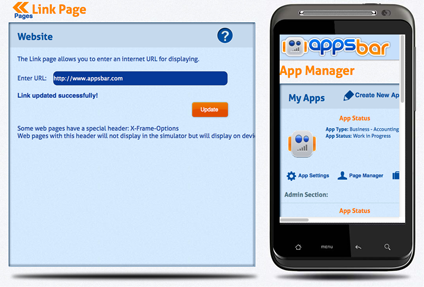 The Website Page of your app is where your existing webpage intersects with your new app you built with the free appsbar app maker. 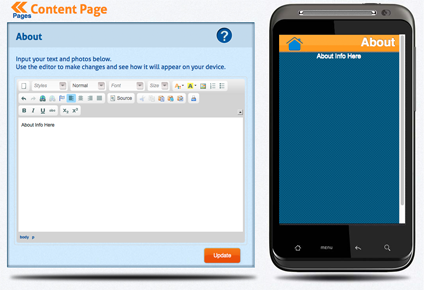 This page allows you to enter your website for display so the user can travel to your company’s URL from your free app. 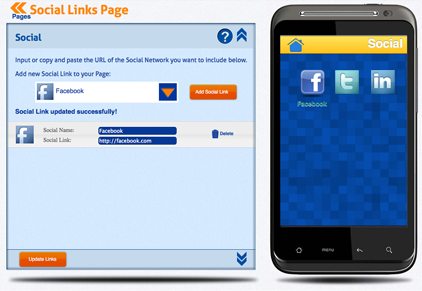 The Social Links Page of your free appsbar app is your opportunity to provide your users with instant access to your various social networking accounts from inside your free app – you’ve already spent a bunch of time creating these accounts so it only makes sense that you want to have them display on your mobile app you built with the free appsbar app maker. You can choose from a list of the most popular social sites such as Facebook, Twitter, LinkedIn, Vimeo, Youtube and Myspace or you can use one that we haven’t even thought of yet in your new free app. The Contact Page of every free app built with appsbar’s free app builder is required and let’s everyone know exactly how to get in touch with your company. 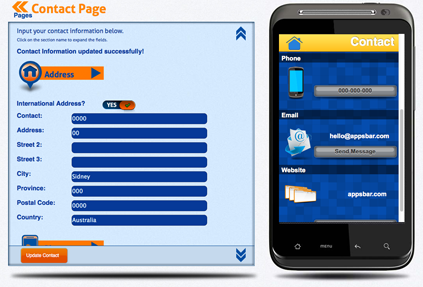 Simply provide the physical address, phone, email and website information on this page of your mobile app. 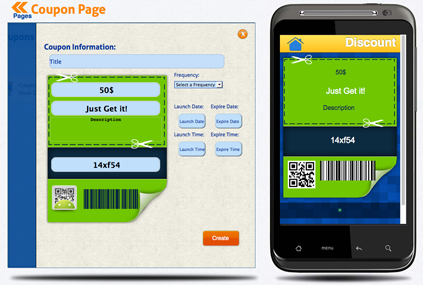 The Coupons Page of your new allows you to create coupons that your user can use for discounts that you are offering to readers through your free mobile app or will be offering in the future. They can be open ended or be created for use during a specific time frame. You make all the decision appsbar is a free DIY app builder and gives you the freedom to control your own coupon offers.